Testimonial: Optimistic attitude towards cancer, I can do it. You can do it! NG MAN HONG, Malaysian, had his own fruit shop and ran the business dedicatedly. He never felt any other discomfort except two 2cm lumps on the neck. Thereupon, he came to hospital for medical examination, and only to be diagnosed as nasopharyngeal cancer stage 2. The suddenly bad news made him overwhelmed. However, he still kept an optimistic attitude. After the exact diagnosis given, chemotherapy was recommended for. Considering the suddenness, he had second thoughts for better treatment options rather than chemo. 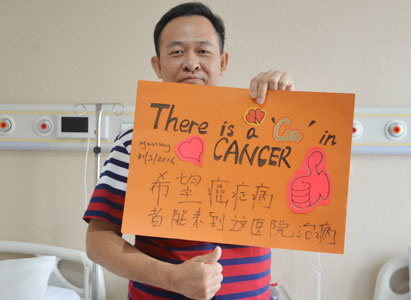 Then he thought of one of his relatives, an 80-year-old cancer patient, who recovered well after treatments in Modern Cancer Hospital Guangzhou. To learn more about cancer treatment, NG MAN HONG visited her specifically. With her age and medical history, she can still ride around. Seeing this, NG MAN HONG strengthened his confidence for treatment in MCHG. Thus, NG MAN HONG came to Kuala Lumpur office for more details. After a face to face consultation with Doc. Xu in KL office, he applied a visa to Modern Cancer Hospital Guangzhou immediately, launching a foreign anti-cancer journey. On May 13, 2016, NG MAN HONG arrived at MCHG, accompanied by his wife. After a few tests, MDT of MCHG recommended interventional therapy for him based on the test results. Interventional therapy is one of minimally invasive therapies guided by DSA imaging machines, which only needs a 2mm incision (puncture point) without operation. Moreover, anti-cancer drugs have a direct effect on cancer cells, which successfully increase the drug concentration on specific lesion, and reduce dosage and side effects meanwhile. Gratefully, only one time of interventional therapy performed, NG MAN HONG’s situation got significant improvement, 80% of tumor disappeared without side effects like vomiting, hair loss, merely poor appetite showed. However, his appetite gradually improved after a few days. Currently, he is in a stable situation. He continues his own business as soon as returns to Malaysia. According to NG MAN HONG, MCHG has personalized medical procedures which vary from that in Malaysia. In Malaysia, a settled doctor takes charge of patient’s case from beginning to end. But here in MCHG, a MDT works together for examinations and treatment plan, which make him assured. MCHG has a multidisciplinary team of experts, who hold together for developing an appropriate comprehensive treatment plan for patients, striving to bring patients the best therapeutic effect. 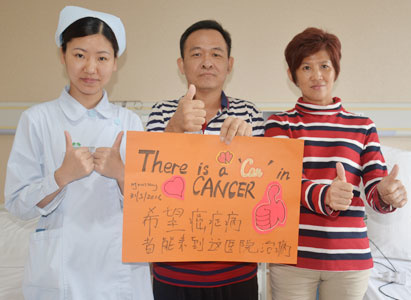 nasopharyngeal cancer, treatment for nasopharyngeal cancer, survivor stories of nasopharyngeal cancer patient, interventional therapy, Modern Cancer Hospital Guangzhou.